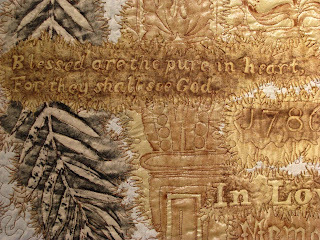 This week I finished my largest Grave Rubbing Quilt to date. I used a suggestion from an earlier title request to give this piece a proper name. Margeeth's title was PERFECT for this piece.....henceforth known as TIME FLIES! The grave rubbings come from Colma, CA; Richmond, VA; Damariscotta, ME; and Birmingham, UK. 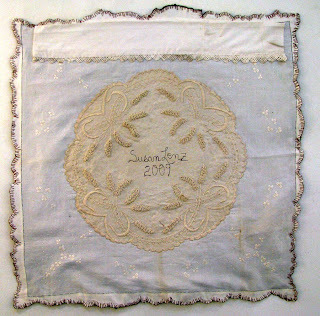 Several rubbings made on various fabrics and various shades were collaged together and hand stitched to the vintage tablecloth that made the substrata for this quilt. 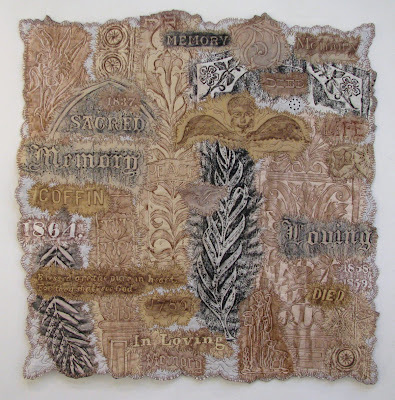 It was both hand stitched and free motion embroidered together. The reverse, however, was created almost miraculously as a manifestation of serendipity. Just last Sunday I had the opportunity to visit the granddaughter of a talented needlepoint artist, Mickey Smith, from Claremont, California. She is now dead and her "stash" went to this nice, well educated, and interested lady...who intends to take up cross stitch...continuing her grandmother's love of counted thread arts. The granddaughter felt compelled to pass on her grandmother's supplies and vintage linens to me...with hopes that I'll give each each a "new, artistic life". Amazingly, one piece was absolutely perfect for the reverse. 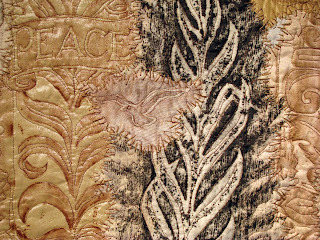 The smaller doily, with outstanding bullion knots, also came from this source. 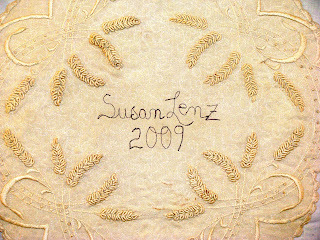 I signed my name and dated the quilt on this piece. All in all, I'm totally thrilled with this work. By the way....tomorrow Steve and I head to Portland, Oregon for a long, romantic weekend along a rocky coast. We have reservations for Halloween night in the Peacock Suite at a Tree House Resort....literally 30 feet above ground...no toilet, TV, etc. ... but with rope bridges and zip lines! We will also be staying in a rustic cabin that includes needed logs for the fireplace! We return on Monday! cool stuff! have fun this weekend. This piece is fascinating. So beautiful and unique. This has got to be one of the best pieces. It is gorgeous. Both the front and the back. And nice choice for a name. I heard about Wayne...looking forward to hearinga about it from you!!! Hope you had a nice time in oregon!